A simple Chrome extension that lets you disable/enable images on "per host" level. Click once and you'll disable images for the current site. Click again and images will be re-enabled. Why does this extension reload current page on turning images on/off? When you disable images on the current site, all the images on the currently opened page are already loaded. The refresh will force the browser to hide them. When you re-enable images, you will need to reload the current page in order for browser to download and show you these images. If you don't like this behavior, go to the "Options" page and uncheck the "auto-refresh" checkbox. Is there posibility to turn all images off for all sites and then add exeptions to this rule? 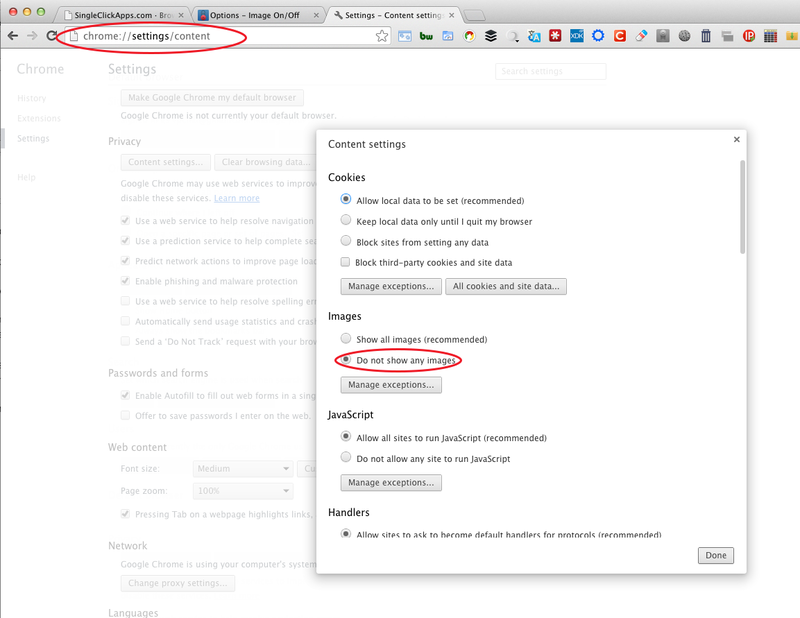 1) Go to Chrome content settings -- just type "chrome://settings/content" (without the quotes) in the URL box and click "Enter"
2) Select "Do not show images" and click "Done"
Now, it will disable images by default for all sites. When you want to enable images on the currently opened site, click the "Images On/Off" icon. What is the license? Where to get the source? This is GPL software, which means it's completely open source. Get the source here. This is open source extension. Get the source here.